I like to knit, and knit all the time. A girl friend of mine got a new-to-her-toy and asked if I could figure it out. I searched the internet looking for information on this model, and it must not have been the most popular passap, I can find information on different more elaborate models, but this is the basic version so I guess I can figure it out??? 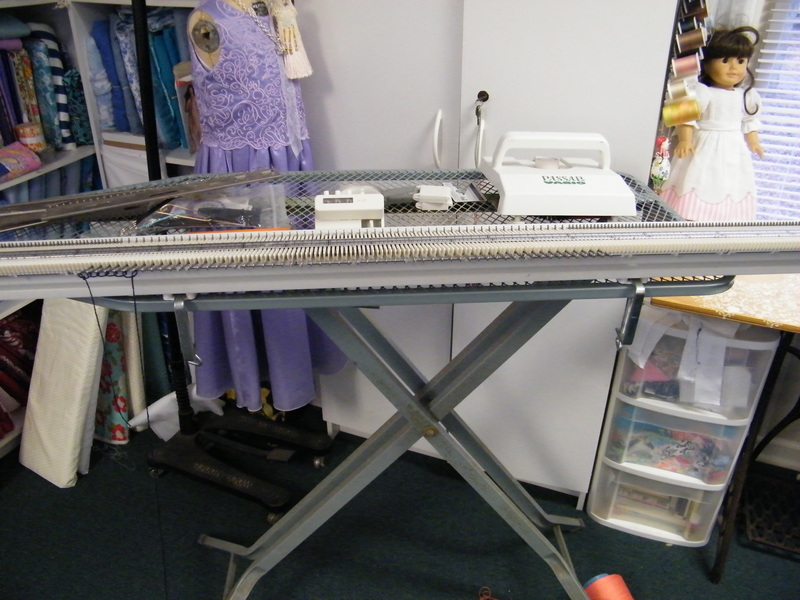 I clamped it onto an old ironing board and I used information based on the Bond Ultimate Knitting machine to set it up. There are differences, but they seem to work on the same principle. Getting started is probably the trickiest part. In the above photo I started by e-wrapping the yarn around the needles. 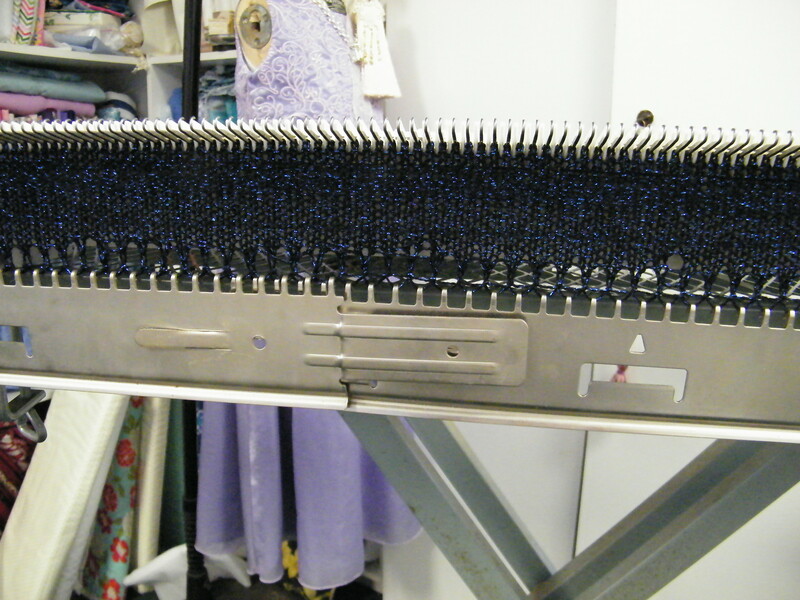 There are cast on combs with this machine, which are basically weights to hold the knitting on the machine. and I think I have figured them out. 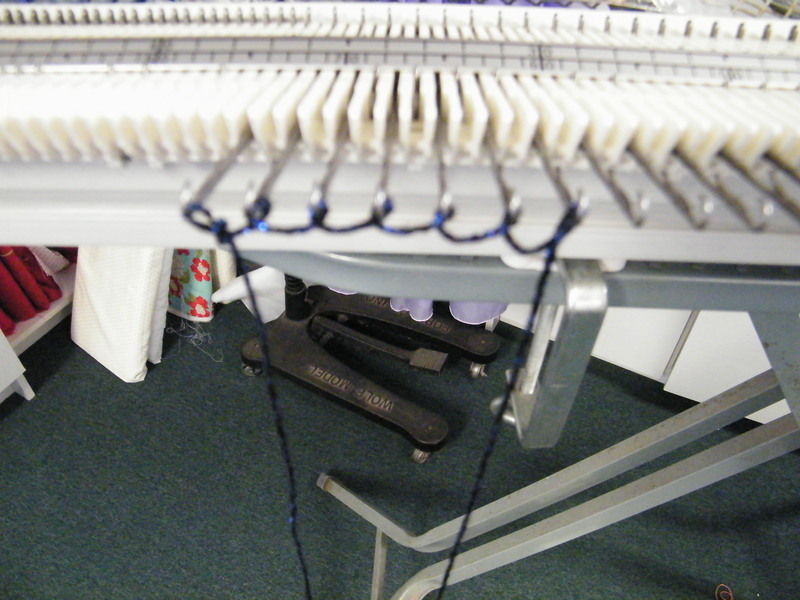 The knitting happens when you lay the yarn in the open needles and slide the carriage over the needles which close the latches and pulls the yarn through the previous stitch… like knitting ….. It’s just a learning curve I have to overcome….. Any information or links would be great. I probably just need some time and not get interrupped every five minutes…LOL…. 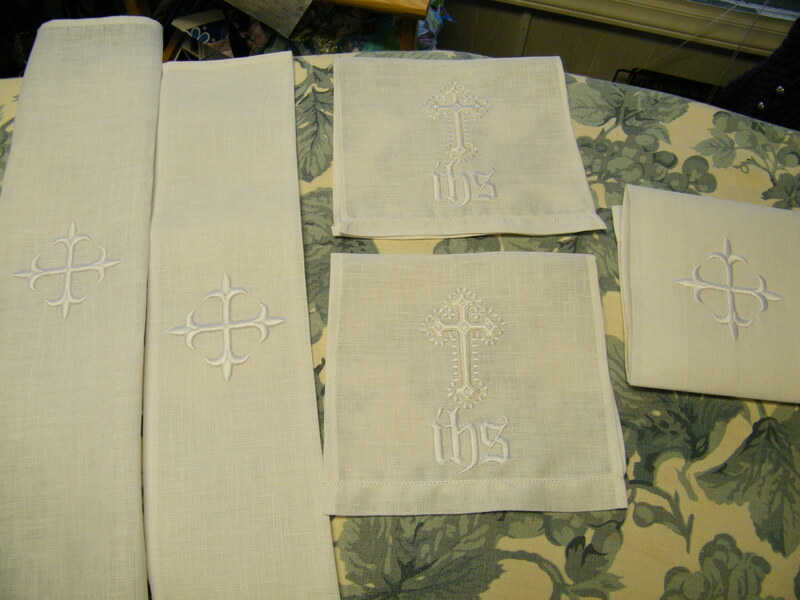 So back to work and today I had Alter linens and new T shirt orders…. I love these linens, I don’t get to do do fine hemstitching everyday so it’s a treat to squeeze that in a days work! These actually are a gift for my church. The sermon this week was in part about finding and using your gifts as the body of the church. I then saw a spot on the linens at communion…. and saw my gift was in need. Another need starts this Thursday at our first choir practice!!! My Daughter and I are going to participate together. I was so excited that I thought that the practice was last Thursday and we went a week early….LOL! There will be a dinner after practice and I am bringing a keylime pie…and I’m making the crust ahead of time. I made one last week for the week early dinner, and when I came back home with it my son was so happy!!! I better make two this week, one to go and one to stay. 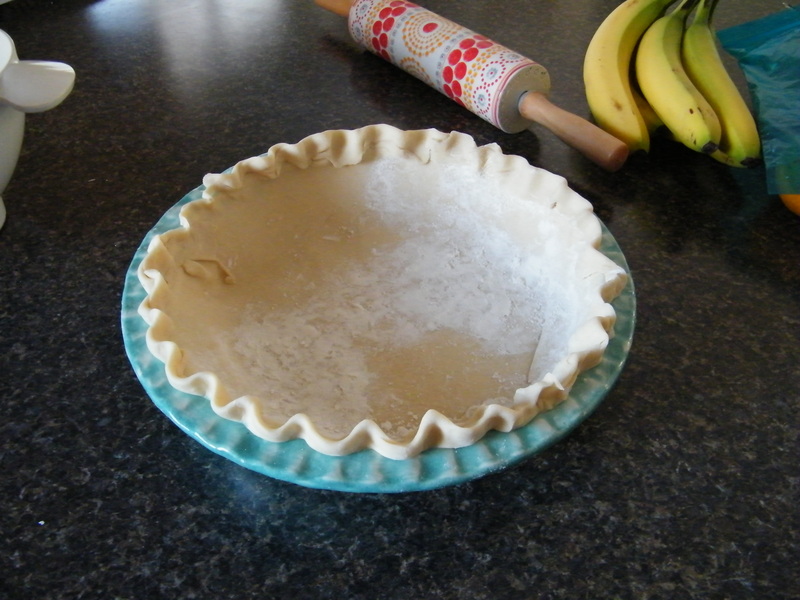 Both the pie dish and rolling pin are gifts to me from my youngest daughter, and they make pie making so much fun! What fun to see your projects…you never stop amazing me!!! Love that precious blue pie plate & colorful dough roller. Hi, Email me if you still need information about your Passap Vario. I can help. Hi Jacqui – hope this message still gets to you a year later! 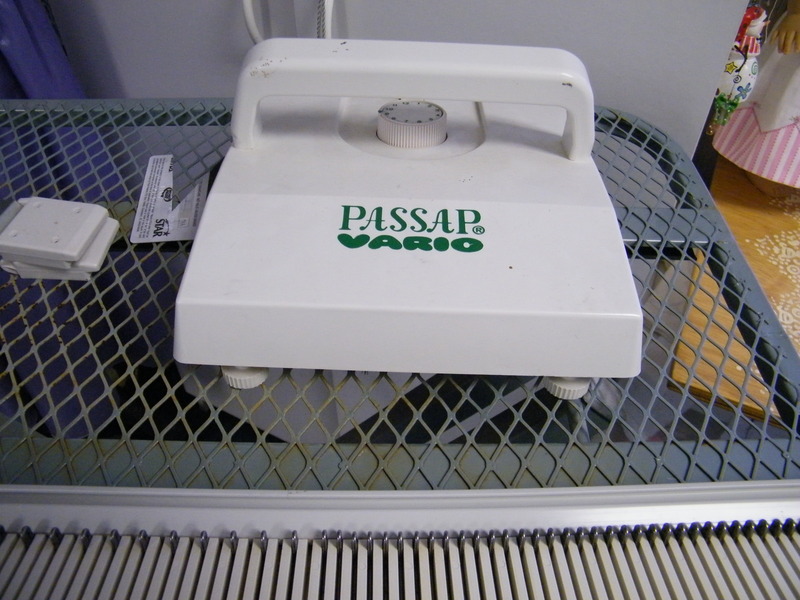 I just purchased a Passap Vario machine – looks to be brand new, none of the pieces are even out of the bags! Anyways, the thing it doesnt have is the manual – do you happen to have one? I used to have a Bond Sweater Machine, but that was years ago and I am finding it difficult to get the hang of the Vario without a little guidance! I am looking for a manual for the vario for my wife. She was given it without a manual. Can you tell me where to get. 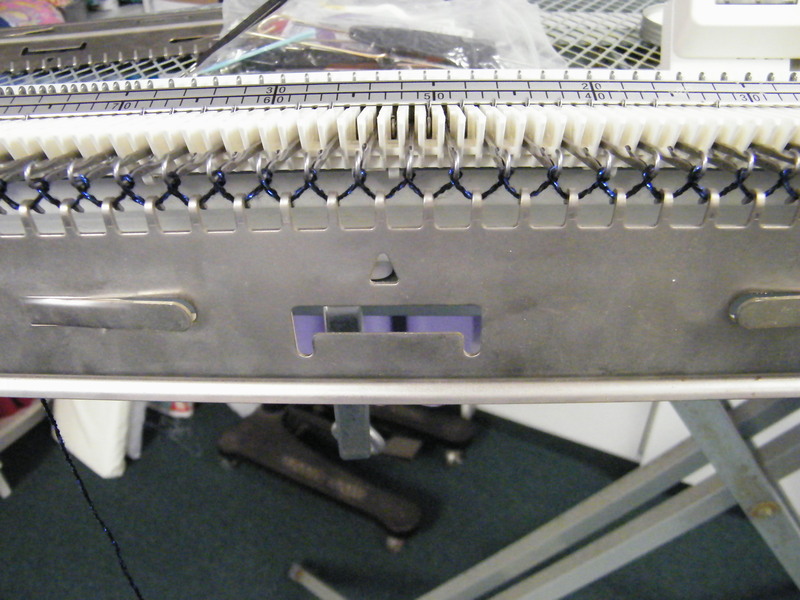 Visit this website: http://www.machineknittingetc.com there are many free manuals for all knitting machines including passap vario. Enjoy knitting.